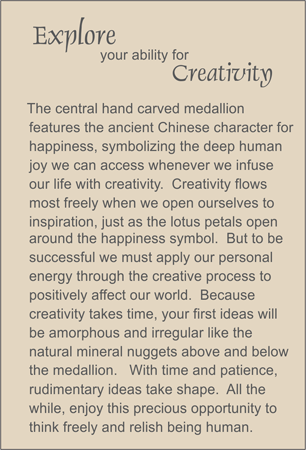 An open lotus flower medallion that represents creativity is suspended in a circle of life serpentine carving, to remind us that a person who is open to new and creative ideas will enjoy fullness of life. The body of the necklace is formed from tumbled carnelian nuggets, inset with two fiery agate nuggets. Carnelian faceted ellipses provide punctuation while facet quartz makes the connection between the necklace and its medallion. Sterling silver toggle clasp.